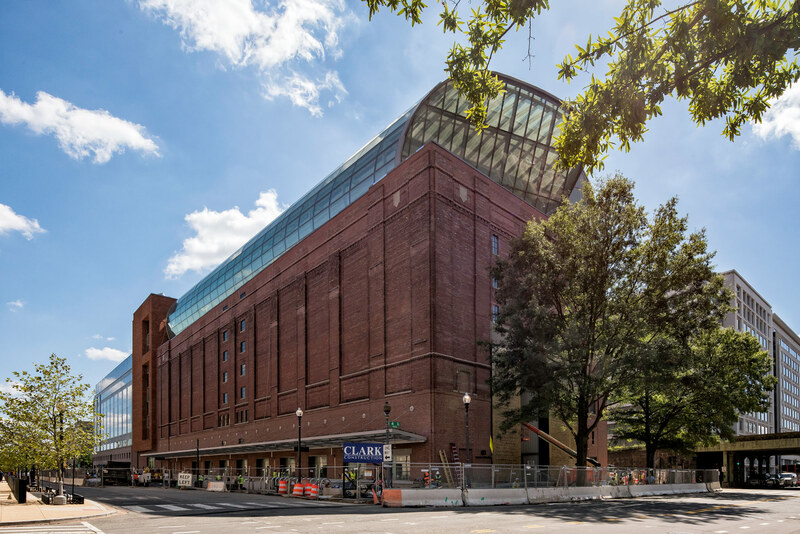 For the Museum of the Bible project, Ennis Electric’s scope of work included design assist and installation of the electrical and fire alarm systems for the 430,000-square foot museum. There were four different areas of work included in this project. The site is situated on a triangular shaped city block occupied by the historic WDC building, the occupied eight story WOC office building and a third hyphen building in between the other two. The historic WDC building accounts for roughly half of the museum space. The historic building façade was braced for stability and the building was gutted. The existing roof was removed. Every other existing floor and the below grade basement floor were also removed. The building column footings were lowered by hand excavating beneath the footings, and then, a new, lower basement floor was installed. These steps created increased vertical height between the building floors. Two new floors and a new roof were then added to the top of the WDC. The WOC building houses museum staff in an added top floor as well as the museum’s Central Utility Plant (CUP), which is in the underground parking garage. An additional floor was built on top of the WOC office building. This new floor provided office space for the museum staff, high-end hotel suites for visiting dignitaries and scholars, and conference rooms for staff and guests. A portion of the WOC’s four level, below grade parking garage was converted into the two-level CUP that contains chillers, boilers, pumps and air handling units that serve the museum space exclusively. The hyphen building was demolished, and its footprint was excavated deeper into the ground to create two below grade levels — one that would align with new WDC basement level and a second deeper basement. Then, a new concrete structure was built from the second basement level up to the penthouse level. Each level of the new structure was built to align and seamlessly adjoin the adjacent WDC building levels, combing the WDC and hyphen into one building. The new hyphen structure’s top floor is the penthouse, which is another level higher than the rest of the museum. The penthouse contains emergency generators, electrical equipment, air handling units and, on the adjacent roof areas, cooling towers and large smoke exhaust fans. The penthouse electrical equipment includes eight 400kW natural gas emergency generators stacked four-over-four that parallel feed a common emergency power switchboard. This project presented many challenges, including a design assist process, an aggressive schedule, unorthodox sequences of work, congested site conditions, a versatile emergency power system, restricted vertical power distribution and a complex mix of lighting fixtures and lighting controls. The project schedule included a fixed end date, meaning that the project had to finish by a defined date, regardless of any unforeseen conditions or owner-initiated changes that occurred during construction. A significant number of both unforeseen and owner-initiated changes were encountered, but the project end date was met. The design assist process required working directly with the design team during design and offering problem solutions and value engineering suggestions. The initial design included four 4000-amp, 480-volt electrical services. Ennis Electric recommended the load calculation be scrutinized to ensure that all four services were needed. The subsequent review determined that three services were adequate. The initial design included three 1MW diesel generators severing segregated loads. Ennis Electric recommend using eight 400kW natural gas, paralleling generators to serve all loads via a common generator bus with controls to shed optional standby loads in the event of generator failures. This option, which was adopted, increased redundancy while eliminating the need for multiple diesel fuel tanks, pumps, horizontal and vertical fuel distribution piping, leak detection and fuel polishing equipment. It also eliminated the operation and maintenance expenses associated with the diesel fuel storage and distribution. The project’s electrical service is located on the basement level and emergency generators are located in the penthouse. The two power systems require multiple interface points to allow switching between sources. The initial design contained overlap that would cause large feeders to be longer than necessary. Ennis Electric reviewed the layout of these feeders and suggested arrangements that reduced feeder lengths by relocating and/or adding equipment to eliminate the overlap areas. The initial design included many large feeders installed overhead on the basement level. Ennis Electric determined these feeders would not fit in the actual overhead space and developed plans to extend most of the feeders below the basement floor, which resolved the problem and allowed for more space for mechanical systems. Most vertical wiring methods require access points to the vertical electrical distribution for maintenance. The designer did not want to have access to the vertical power distribution shaft way. Ennis Electric found a solution—a riser MC cable. This cable is rated to vertically support its internal conductors by clamps on the cable jacket. This product did, however, create construction challenges. The riser MC cables could not be installed until the hyphen structure was completely topped out. However, major construction activities were ongoing on the lower levels of the hyphen well before it was topped out. As a result, the cables needed to be installed quickly as soon as conditions would permit since a lot of other work on the lower levels were waiting on the cable installation. The 24 runs of three-inch diameter, custom ordered riser MC cables each had to be pulled continuously from one end to the other while maintaining a minimum 48-inch bending radius from the second basement level up to the penthouse. This route included 170-foot-long horizontal run on the B2 level, a vertical run of 160 feet and another 120-foot-long horizontal run in the penthouse, each of which included many changes in direction, i.e. bends. The cable installation process had great risk because the cable jacket could not be repaired if it pulled apart. A new cable would need to be ordered, resulting in a time impact that the project could not afford. Ennis Electric was ready to install the cable when the time came. The cables were installed by working extended hours in a three-week period with no cables damaged. Electrical construction is typically executed by first installing the major distribution infrastructure, followed by branch circuit wiring installed to lighting, receptacles and equipment, then trim-out and energization. The museum was effectively built as two-halves— the WDC and the hyphen. The WDC structure was available for installation before the hyphen structure was built so work was done to include all finishes in advance of the hyphen areas. However, the major electrical distribution was located in the hyphen and could not be installed until after the hyphen structure was complete and ‘dried-in.’ As a result, temporary power was used to energize and test the WDC areas. Later, when the permanent distribution was complete, the WDC circuitry was extended to the permanent power. This increased the amount of work for Ennis Electric, but enabled the rest of the project to move forward until the hyphen was available, which was critical to meeting the project end date. The project included a multitude of different lighting fixtures and lighting fixture controls. 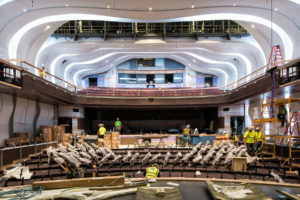 Throughout construction, many fixture types were changed, added and deleted. Each of the fixtures required significant effort to insure they met project specifications, had proper controls and could be coordinated and installed with a myriad of high-end finishes. 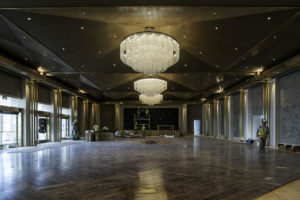 The challenges with lighting fixtures is an exhaustive list of issues, but Ennis Electric managed these issues and successfully installed all the final fixtures before the project’s completion date. The construction site was congested from start to finish and virtually no on-site storage was permitted. These conditions mandated off-site storage of all materials and just-in-time-delivery for all materials and equipment. Major equipment required substantial coordination efforts in advance of delivery and installation. One example was the eight generators that were installed in the penthouse. To fit the generators in the small penthouse space, the generators were stacked with four generators on the floor and four immediately above on a steel framework with a grated floor. The generators could not be installed until after the hyphen structure was topped out and structural steel framework was complete. As soon as these items were completed, the generators also needed to be installed so the exterior wall could be built. This work had to be performed on a weekend because a crane would block too much activity during the week. Ennis Electric’s first opportunity to install the generators came the day after the 2017 Inauguration, which coincided with a massive march in downtown Washington, D.C. that began in front of the WOC building. The project could not afford a week of delay, so Ennis Electric carefully planned with our rigger and the scheduled street closures. We managed to get the crane, support vehicles and all generators to the site before the streets closed and protesters arrived. The generators were hoisted and rigged into place by mid-afternoon, and when the trucks were ready to roll out, the streets were opened and the protest had moved elsewhere – another challenge, another success. The fire alarm systems also provided a myriad of challenges. A new fire alarm system was provided for the museum and the existing WOC fire alarm system had to be expanded for the roof-raising addition and the parking garage CUP. During the design it was determined that the museum (WDC and Hyphen) was a separate property from the WOC, divided by a party wall, so these buildings would have separate and segregated fire alarm systems. While this concept seemed clear in theory, it presented plenty of challenges in practice. 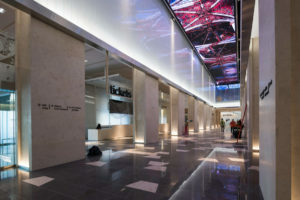 By the end of the project, the two separate systems had some interface due to CUP equipment serving the museum and its elevators serving the new WOC ninth floor. The greatest challenge presented by either of the fire alarm systems was the completion, pre-testing and final acceptance testing of these systems. Fire alarm systems are designed to make known any problem they encounter, no matter how small. To properly test a fire alarm system, the building must be complete. A fire alarm system monitors, controls and/or initiates operation of mechanical systems, sprinkler systems, emergency power systems, elevator systems, smoke exhaust systems and stair pressurization systems. In addition, the fire alarm devices are installed after the walls and ceiling are finished. The fire alarm system must also be tested and accepted by the Authority Having Jurisdiction (AHJ) before a building can be occupied. The museum fire alarm system includes an atrium smoke exhaust system, four stairwell pressurization systems, 10 elevators, 13 pre-action sprinkler systems, two commercial kitchen hoods, 56 sprinkler flow switches, 55 tamper switches, 31 duct detectors, 43 manual pull stations, 230 smoke detectors and 83 heat detectors. 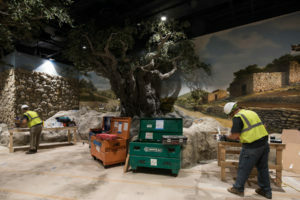 A project with the size and complexity of the museum should take four-to-six weeks for pre-testing after finishes were completed, followed by another three-to-four-weeks of acceptance testing with the AHJ. Every trade on the museum project was struggling to complete their work before the project’s completion date. And, as that date approached, it became apparent that Ennis Electric would not get the proper conditions and sufficient time to pre-test and then acceptance test the museum fire alarm system. To solve this problem, a group of Ennis electricians decided to literally commit their lives for a six-week period to completing, pre-testing and acceptance of the museum fire alarm system. The Ennis Electric crew worked 12-hour days, six days a week. Some crew members worked 16-hour days and slept in local hotels for a few hours before returning to the jobsite as well as several Sundays. In the end, the commitment of these Ennis Electric employee owners ensured not only that the project was completed on-time, but also the integrity of this critical life-safety system.